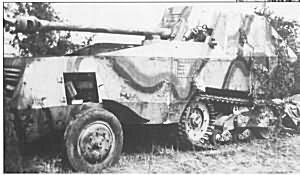 This vehicle was again built for the Division, mating a PaK 40 7.5cm anti-tank gun to the chassis of an ex-French Somua MGC half-track. It replaced the normally towed anti-tank guns in the Panzer-Grenadier Regiments. 192 Pz Gren Regt., June 1944. Picture from pg 75, Georges Bernage and Jean-Pierre Benamou, Goodwood  Bombardement géant anti-panzers, Editions Heimdal, 1994. 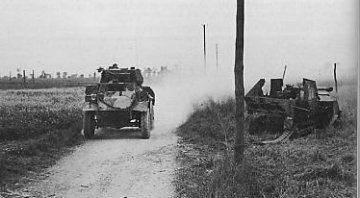 Destroyed vehicle to the right of the British armored car is identified as part of II./125, 8th Heavy Ko. 7.5cm PaK 40 on Somua MCG S 307(f) . 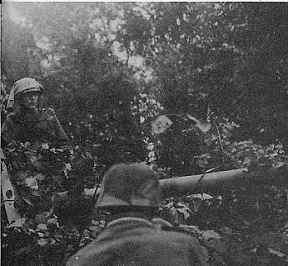 Dug in 21st Panzer vehicle at Cairon before D-Day. Picture from Alexander McKee, Caen Anvil of Victory, Dorset Press, New York, 2001.